Mash is a side-show no more at this charming one-off café which puts the spud centre-stage. 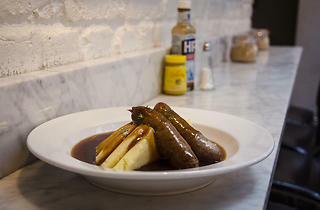 It’s a simple set-up at this charming café where the spud is king: choose your preferred style (and texture) of mash, add a couple of meaty sausages or a pie, then select a gravy flavour. The mash, which ranges from a pokey mustard-and-cheese-laden version to traditional colcannon dotted with bright spring cabbage, was heavy and overwhipped, but satisfyingly rib-sticking, while pies were well proportioned, with golden hot-water-crust pastry that held together well. What stops Mother Mash entering ‘ye olde mash shop’ territory is friendly service and an attractive modern dining room, with plenty of daylight, white subway tiles and marble tabletops. However, pinched seating is a squeeze for couch potatoes. If you want a super quick bite before a theatre, that’s your place. It’s modelled on a traditional Eat End pie and mash greasy spoons, but fear not you find jelly eels on the menu! Instead, there’s a list of glorious mash and I can tell you, it will be the best you’ve ever had! Beyond a simply buttery one, you have several posher options of the dish – with horseradish, with cheddar, with cabbage. It comes with bangers or a pie. It was the veggie pie that didn’t have the same level of deliciousness as the spuds (the onion gravy was first class). It seemed as if it had been baked and reheated, the top crust was really hard and flavourwise, I wouldn’t say it was the best I’d had. What a traditional pie and mash cafes lack in food, they make up for in the homey atmosphere and friendly staff. The waitresses here were disengaged and not very warm. Despite that the place is highly popular, so I recommend booking a table. Mother Mash pleasantly surprised me. What I thought was initially a quick in and out diner joint was actually a lot more substantial in pie and experience. Staff are friendly and happy to talk you through the menu. I opted for a chicken pie with champ and gravy which was delicious and more filling than I was expecting. Good quality and size for your money, it makes much more sense to pop in here before heading to McDonalds etc. Although it doesn’t quite have the atmosphere of a restaurant it’s a nice in-between for when you want something quickly but don’t want to compromise. Whole meal with glass of wine came to £13-15 which is ok for central London. I just love this place for pies: tasty, moist and with a good choice of flavours, I love to order them as take away to devour with salad at home as a way to find a little bit more balance (or fool myself). Could never ever go for anything else on the menu, but can seriously vouch for the Chicken Leak and Bacon and Roasted Squash with Goats Cheese. Prices are very affordable, considering it's right around the corned from Carnaby Street, and staff is usually friendly and helpful. Great shout for wholesome food that delivers just what it promises. I'm from NYC so I don't know a WHOLE lot about English food but I do know the food at Mother Mash is simply delicious. It seemed at first like it could be a bit of a tourist trap as we had to (literally) squeeze through the Christmas masses gawking at Carnaby Street to get there, but inside, the place and food are simple and comfy. The restaurant reminds me of a diner but the food is of much higher quality. I also like that there are so many ways to mix and match the pies, mash and gravy. And please do yourself a favor and get the chicken pie! There are a few dishes which I cannot see a point in ordering in a restaurant - fish finger sandwiches, scrambled egg on toast, bangers and mash.... well - who doesn't think they can't make it better at home??? Usually I would avoid this like the plague but the quality of the sausages and the simple and balanced additions to the mash make this an exceptional exception - yes - the place is a bit pokey, but the standard of food and friendly service make it well worth the trip. 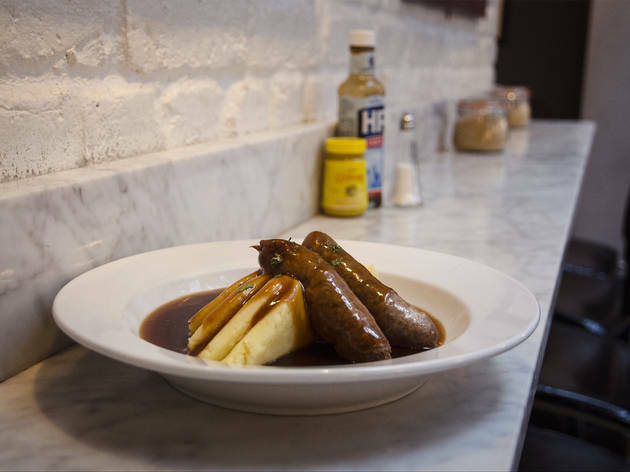 Close to Carnaby Street, Mother Mash is a nice cheap'n'cheerful restaurant serving pies, and simple but tasty sausages and mash dishes. You just need to choose one of their free range sausages (pork, lamb, with leek, chili, etc) or pies and the type of mash (with mustard, cheddar, onions, etc). Simple and delicious! Perfect when it's getting cold outside. Everything you want it to be; wholesome food that won't break the bank. The Champ mash is my personal favourite, with the cumberland sausage, swimming in onion gravy. All for under a tenner! There's plenty to choose from, not just bangers, there's pies and puddings too! Staff are friendly and as you'd imagine, the decor gives a homely feel. But if you haven't got time to settle in, you can get take away too! All in all a smashing place for a hearty lunch in Soho. Cheap and cheerful! Great pies! How can you go wrong? Amazing food, service is good too, price is okay. 3 pie and mash and 1 bangers and mash all excellent, Crumbles were good with custard or ice cream, Gingerbread pudding was lovely however portion was a little small, hence 4 stars.